Water is a very important element in keeping your dog healthy. If your dog is sufficiently hydrated, he will be able to dissolve and carry nutrients throughout his body. Water will also improve his digestion, circulation, waste filtering, and body temperature regulation. It is important that your dog gets one ounce of water for every pound of body weight. Here are some important tips on how to keep your dog hydrated. A good-sized water bowl – You should fill a water bowl with twice the amount of water your dog needs. Dog drinking bowls can be purchased online. Buy steel or a hard plastic dog water bowl, as they will last a lot longer. Check for dehydration – Signs include lethargy, dry gums, and sunken darkened eyes. If you feel your dog it dehydrated, visit a vet immediately. Clean your water bowl daily – Your dog’s water bowl should be free from bacteria and therefore should be cleaned with dish soap daily. You should also brush the rims and the sides with a bottlebrush. Place many water bowls – If your dog moves around your home and garden, it is a good idea to place a few water bowls in a number of places. 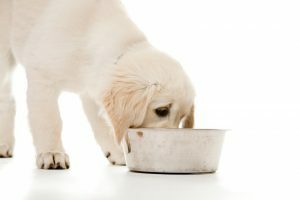 Filling your dog’s water bowl – Make sure that your dog’s water bowl is full throughout the day and that more water is placed on hotter days. Look at pet website for shopping deals on water bowls. To ensure your water bowl stays in place while your dog drinks look for those that are weights around the rim.